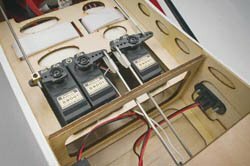 Choosing the right RC servos for YOUR RC airplane is much easier than you might think. Servos are literally the "muscles" that control every moving part of our RC airplanes. Servos actuate the control surfaces, throttle, landing gear, smoke, and anything else aboard the airplane that needs our input while in the air. Different types of servos are better suited for different applications, each with advantages and disadvantages. This page you will explain the different types of servos and options available in order to help you choose the right servo for your application. If you're interested in how servos actually work and how they communicate with your receiver and transmitter then be sure to check out this tutorial on RC Servos. The literature for just about every RC airplane, whether it be a kit or ARF, will recommend a certain servo. Many times the recommendation will be a specific model servo of a brand they support. It's always safe to stick with what the manufacturer suggests. But what if you want a different brand to match your radio? Or maybe you want better performance out of your plane? You want a servo than can handle the torque required to move your control surfaces quickly and precisely. A servo's characteristics are defined by the following specifications. 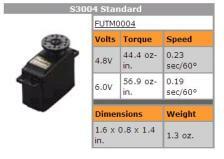 As you can see in the specifications for the Futaba S300 standard servo above, the torque and speed depends on the voltage of your onboard battery. Torque is a measurement of the strength of a servo. 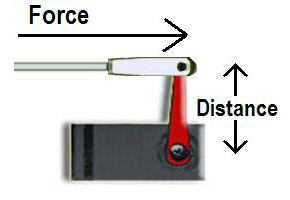 Torque is determined by multiplying the force acting on the servo arm by the distance from the center of the servo. The air passing by the airplane is always trying to make the control surfaces move. The servos must "fight" this air resistance in order to move or hold the control surface neutral. As the size of an airplane increases, the wind resistance acting on the control surfaces increase. This is why larger airplanes need RC servos with more torque than smaller airplanes require. However, the size of the airplane isn't the only factor that determines how much torque you need. The type of airplane you have as well as your flying style will ultimately determine how much torque is required of the servos. 3-D airplanes have very large control surfaces which require much more torque than a non 3D sports planes of the same size. Also, if your flights tend to be gentle and laid back, you can by with less torque than someone who likes to jerk the sticks around to perform crazy violent maneuvers. The speed of an RC servo is defined as the minimum amount of time it takes the servo arm to rotate 60 degrees at maximum rated torque. Obviously if the servo is being used on a control surface, you want the speed to be as fast as possible. If the RC servo is used on the landing gear, you'll probably want the speed to be a bit slower. Don't be deceived by the speed rating. The "top speed" of a servo isn't an accurate measure of how quickly the servo responds to your stick movements. Speed is a very important specification, but there are other factors that we will discuss below that will ultimately determine how quickly and precisely the servo responds to your input. There are RC servos specifically designed for just about any size RC aircraft out there. The first step is to find a servo that meets your torque requirements, then make sure the weight and dimensions are suitable for your airplane. The shaft of an RC servo is supported by either a ball bearing or a bushing. A servo with bearings will operate much more smoothly and will last much longer than a bushed servo. Most standard size servos these days will have either 1 or 2 bearings on the output shaft where it exits the servo case. Many micro servos do not have bearings because the loads are too small to justify the added weight of bearings. In contrast, most large scale servos need two bearings to support the large loads of the control surfaces. Kits are available that supply the ball bearings and case tops in order to replace the bushing with bearings. These kits provide a very economical way to upgrade your servos without having to replace them. The motors inside of our servos turn much faster than we would ever need the servo to move. For that reason, every servo has a set of gears that reduces the speed of the output shaft. As with any gear reducer, this also causes the torque of the output shaft to be much higher than the torque of the motor. Most servo gears are made from a type of plastic called nylon. Sometimes under excess torque these plastic gears will strip out. If you're lucky, you will get some warning signs before having a catastrophic failure that destroys your airplane. But there have been a many of crashes due to stripped servo gears. Many large scale or 3D pilots will buy RC servos with metal gears. These are bit more expensive and they weigh a little more. But they will withstand a lot more torque than standard plastic gears. The only downside, besides the added weight, is that metals gears will wear over time and this leads to slop in the servo. This wear happens slowly and gives you plenty of warning, as opposed to set of nylon gears that has the potential of stripping any time it is overloaded. 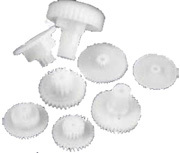 Replacement gears sets are readily available for both metal and plastic. So when you destroy the gears in your servo, it is cheaper to replace the gears rather than buy a new servo. The physical working portion of a digital servo is exactly the same as a standard RC servo. Both have the same plug and both can be used by a standard receiver. The only difference is the digital servo has a microprocessor that modifies the frequency of the control pulses to the motor. If you're not familiar with how a standard servo operates, you may want to read this page that explains pulse code modulation in order to have a better understanding of the following discussion. Lets say you only want to move the servo a tiny bit, so you barely move the transmitter stick off center. A standard servo will receive a series of extremely short full voltage pulses 50 times a second. These very short length instantaneous voltage pulses occur so infrequently that the motor doesn't even react. The amount of transmitter stick movement from center position that is required to make a servo start moving is called the servo's deadband. If you're flying a trainer or sports RC airplane, the deadband isn't a huge deal. But if you're a helicopter or 3D pilot you need every bit of the stick movement to count. Too much deadband could lead to a dead plane! A digital servo's microprocessor will convert the signal to shorter length pulses at a frequency of 300 times per second as opposed to 50 times per second of the original PPM signal. The motor is able to respond to smaller stick movements because it is receiving those very short pulses 6 times more often. This also gives a digital servo much stronger holding power because it reacts much more quickly when pushed out of position. Digital servos react to your stick movements much more accurately than standard RC servos. You can think of this like the frame rate of a video. A video will appear much smoother if the frames are shorter and appear more often, as opposed to longer frames that occur less often. This same logic can be applied for understanding why digital servos give you much more precise control over your RC airplane. This is a good article from Futaba if you want a more in-depth explanation of how a digital servo works. If you've been shopping around for a servo you have probably noticed the different types of servo motors available. You will see 3P, 5p, coreless and brushless. So which one should you choose? Most RC servos on the market are either 3 pole(3p) or 5 pole(5p) motors. All DC motors have a set of permanent magnets that the electromagnets(windings) are attracted to. These permanent magnets are called poles. The torque of the motor can be reduced if the electromagnets happen to be precisely in between two poles when the servo is trying to hold position. In other words, 5P motors will have more holding torque with smoother operation than 3P motors. If you're a beginner, there probably isn't enough difference that you would even be able to tell. In a conventional motor, windings are wrapped around a metal core to form the electromagnets. A coreless motor does not have a core. The windings consist of a wire mesh that rotates around the outside of the permanent magnets. This eliminates the problem with reduced torque at certain positions as discussed above with standard "pole" motors. A coreless motor will also respond much quicker to stick inputs because it doesn't have to overcome the momentum of a metal core when changing directions. 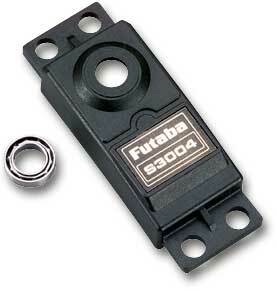 Futaba has recently developed a brushless servo motor. So you get all the benefits of a brushless motor incorporated into your servo. This translates into longer servo life, faster response time, smoother operation and resistance to vibrations. All RC servos will have three wires. One wire is positive lead (+) from the battery. One wire the ground (-) from the battery. The third wire is the control input from the receiver. It is important to note that you can't just swap the pos. (+) and neg. (-) to reverse the servo. Doing so may damage your servo and receiver. You can buy connectors that act as a servo reverser by reversing the control signal. A Y connector is commonly used with two ailerons servos that share the same receiver output. The Y connector reverses the signal to one servo so that the two aileron servos act opposite of one other. Futaba's "J" connector is a plug with a little plastic tab, or key, that prevents you from plugging it in backwards. Futaba's J plugs, Airtronic's Z plugs, Hitec's S plugs, Hobbico's U plugs, and JR's connectors are all compatible as long as you make sure the wires are in the correct order within the plug. If you want to plug a male Futaba plug into another brand you will have to shave the safety tab off. If your servo is a different brand than your receiver, it is critical that you have the appropriate wires lined up before plugging the connectors together. The wires can easily be popped out of the connector for rearrangement. The images below show you the wiring schematic for the plugs of the four major servo manufacturers. The above images were provided by Blue Point Engineering.